‘The Healthy Homemade Dog Food Cookbook’ is a book packed with not just tasty recipes, but a ton of nutrition information and tips to keep your dog healthy. I was surprised by how easy most of the recipes in here are to make, most with on-hand ingredients. There are even recipes for the holidays, puppies, and dogs with sensitive stomachs. I found the chapter on allergies and making your own shampoo and conditioner to be very handy as well. 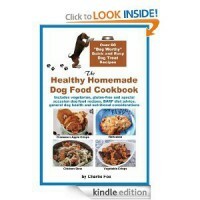 This is a wonderful addition to my recipe collection as my puppy is no longer left out of my cooking.